I did a post the other month about me trying to wear less makeup, which is something that is completely new to me. Before I was a bridesmaid, I was so good with my skincare routine and I started to see big differences in my skin and how it looked before makeup. As much as I love makeup, the ultimate goal is to be able to go out to work and not have to worry about putting any on. Because of that, I have tried to strip back my everyday makeup routine a little and go for an easier and more natural makeup look, so I thought that I would share that with you today. For this look, I just reach for some of my go to products, that I know work really well for my skin. Since I bought this moisturiser well over a year ago, I have made no secret about how much I love it. The only reason that I wanted this Charlotte Tilbury Magic Cream was because of how I heard Charlotte Tilbury herself talking about it. She literally made this sound like the best cream in the world, and within an instant, she had me sold. The only thing that I was a little weary about was the price tag. At the time, this was the most expensive face cream that I had ever bought, but I just thought that the only way to really see if it was worth it, is to just try it out for myself. So, I bought it and fell in love with it. To start with, I had reservations about this because of my combination/oily skin. In some places, I just thought that adding extra moisture to my skin would just make my skin look wet, so I am very particular about where I apply this. I tend to apply a nice thick layer of this to most of my face, but I completely avoid the whole area around my nose, this is my problem area with oils, so I don’t want anything to go there. I find that this makes my skin look nice and healthy, in no way dry and it gives me a stunning base to go in with my makeup. When I have a good layer of this on, I tend not go in with primer, because I just don’t feel like I need it. I know that this foundation doesn’t need an introduction here on my blog, but I still thought it was worth a mention because I love it so much. I have said it time and time again, but I really think that this is my all-time favourite foundation. When I first saw this product being splashed all over the internet, I didn’t think that it was going to work for me. For a girl with combination/oily skin, a foundation with the word ‘glow’ in the title, just don’t go together very well. But I was sick of seeing people using this in YouTube tutorials and it is looking amazing on them and I hadn’t even tried it out. So, I went onto the Space NK website and decided to treat myself. Since, I bought this, I really have been hooked on it. My skin never looks as good as it does when I use this foundation. The coverage is just out of this world and it blends in like a dream. I like to use it with my trusty Morphe M439 buffing brush and it just gives the most incredible look on the skin. I would say that this makes the skin look healthy, but it doesn’t do that by adding excess oils to the skin. I really could talk about this foundation all day long, but I think that it has a cult following for a reason and that is because it is just a really great product that deserves the following that it has got! This is quite possible the most under-rated makeup product, ever in the world. What I just don’t understand about this product, is why more people don’t talk about it and why Chanel don’t promote it more. I first found this one day when I was loitering around the Chanel stand in my local Boots, while I was in line to pick up my repeat prescription of Chanel No5. I saw this on the stand and I decided to swatch it and give it a go. I instantly loved how it looked on my skin and I just knew that I had to buy it and try it out. I quickly became completely obsessed with it. The thing that I love the most about this concealer is how it looks on the skin. I go in with just the smallest amount of this to highlight and conceal and I feel like it does the job so prettily. If I blend it using my damp Beauty Blender, I will get a nice medium coverage and if I use a brush I can get a full coverage, depending on how much product I go in with. This is just a really great product that is very perfecting and looks lovely on the skin all day long. I have never noticed this breaking up on my skin and it always looks like it has only just been applied. I guess the shade range is something that sets this back, but other than that, I think that this is a real winner! I know that I have mentioned this countless time on my blog, but I am still not over this incredible RCMA No Colour Powder. I first tried this out, way back when it wasn’t even popular on YouTube. Wayne Goss used to mention this on his channel all of the time and I really wanted to try it out. So, I bought it and I have been obsessed with it ever since. I’m not denying that I love other face powders, such as the Laura Mercier Translucent Powder, but nothing can take the RCMA crown in my eyes. I just think that for the money, you cannot get a better deal with other face powders. Not to mention, that the quality of the powder, really is second to none. What I like to do on a daily basis is add a really light layer of this all over my face. I will use this with my damp Beauty Blender to set the area under my eyes with a light bake, then for the rest of my face I will just apply a light dusting to set all of the creams and liquids into place. Another thing that I have realised that I love this powder for is carving out my cheekbones and tidying up my bronzer and contouring. I will say that the packaging isn’t really that great, but I just pour a little into an empty pot and use it from that and I have no issues! I know that I have harped on about this product so much over the last year, but I am so obsessed with it. I am actually that obsessed that I am onto my second one of these, and that very rarely happens with bronzers. I first saw this bronzer on YouTube, my main girl Casey Holmes was using it and if she likes something, then I like it too. The only thing that put me off about this for quite a while was that a few people said that it had shimmer running through it, and I am not really a fan of bronzer with shimmer or glitter, I am a matte girl all of the day. But, when I bought the Too Faced Born This Way Foundation, I decided that it was time to finally treat myself to this! Within an instant, I was completely hooked. As you can see from the picture, it is a two-toned bronzer, so you have a lighter and a deeper shade. When I use this, I just mix the two together and go in with that. I can remember when I first got this delivered, I was worried that it was going to be too light for my skin, but it is just the most perfect shade. It glides onto the skin so stunning and pairs so nicely with all of my other products. I love to use this really lightly on a daily basis when I am going to work, and I feel like it just makes my basic makeup, look much more pretty, and the shimmer makes me look glowing and healthy and it is no-way over the top! This is pretty much one of the only eyebrow products that I reach for time after time. I go through stages of using other brow products, but nothing really holds up as well as this one does. Before I first bought this, I wasn’t really very sure about it. I saw lots of people using it on YouTube and on some people, it looked really good and on others it looked really thick and waxy. I really wanted to try it for myself, to see how I could get it to work for me. I will admit that for a really long time, it was just trial and error to try and get this to work for me, but I feel like in the end, I go to a place where I really love this Anastasia Dip Brow Pomade. I will go for one of two looks in a morning when I am getting ready for work. I will either go in and just outline my natural brows with this and then fill in sparse areas, this is just a really quick and easy way to use this product and my brows are on in no time at all. If I don’t go for the simpler brow look, I will go for the stunning soap brows. Now, I say that they are soap brows, but I don’t use soap, I just use my clear Anastasia Brow Gel. I like to comb all of the hairs up and lock them into place with my brow gel and I then go in with tiny hair like strokes to fill my brows in. This is just a really great product, now that I have finally mastered it! And the last thing that I want to mention that I really cannot go a day without is my Lancôme Grandiose Mascara. I first tried this out at the start of 2017 and to be honest, the only reason why I bought it was because of the packaging. I was walking through Boots and I saw this and just seemed to migrate over towards the counter. Even though it cost more for this mascara than one of their standard ones, I still had to go for it and try it out, just because there is a rose in the end of the packaging. But, then when I started to use this stuff, I realised why so many people love it so much. This mascara really is unlike anything else that I have ever used before. The wand on it for starters is just perfect. When I first started using it, I wasn’t sure about the kink in the wand, but it actually makes it really easy to use, once you get your head around it. Plus, the wand is super short, I thought to start with that it would be a pain in the arse, but it just means that you get a much more accurate application, which stops me from getting little dots on my eyeshadow, which I tend to do so often. I genuinely do love this mascara and it is one of my everyday essentials, even though it is a pretty pricey product. There you have it, my everyday makeup products. Like I said, I know that I have mentioned these so many times here on my blog, but they just work really well for me. My skin always feels really heavy and never cakey when I go in with this product combination. I love reaching for these products and that is why I have to repurchase them time and time again. As normal with all posts here on my blog, I will link down below to everything that I have mentioned. If you want to see my full review on any of the products mentioned, just click the product names above. Make sure to leave me a comment down below and let me know some of your favourite everyday makeup products! It is such an amazing foundation! Wow these products sound amazing! I recently broke my Nars foundation because i had the screw on lid. I think you're much better off with the pump lid. Great post! I don't know why they don't just sell it with a pump, it's what we all want! Your products look very amazing! I didn't know anything about Charlotte Tilbury Magic Cream. Thanks for sharing your impressions! I need to check it! It is such an amazing product, I am so in love with it! Nice picks - I really want to try out the magic cream now! I wish I had tried it out sooner! I've recently gone back into using the rcma no colour powder, it looks so good on the skin but it's so dam messy! I just wish they had gotten the packaging right. No matter how I use it, my vanity always looks messy afterwards, at least I know it makes the base look awesome. I have popped some into an empty Laura Mercier pot that I had, makes it much easier to use! Aww thank you sweetie. 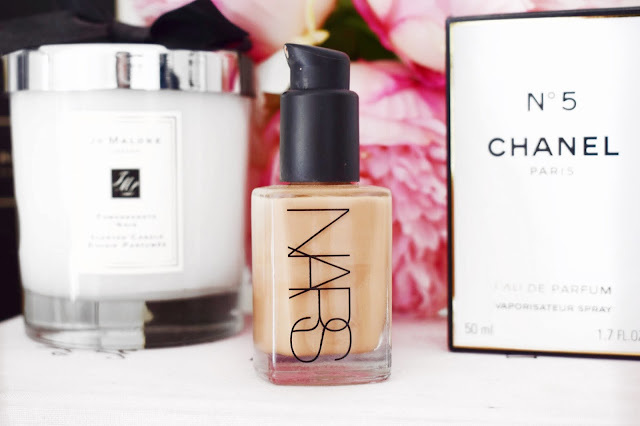 I think that Nars Foundations are the best! It has been one of my favourites for such a long time, I'm still not over it! I just cannot believe that more people don't talk about the Chanel Concealer! Blogger classics is what I am all about!